Zimbabwe’s President Robert Mugabe is to meet the army chief amid intense pressure for him to step down. Mediation will be led by a Catholic priest, state TV said. Mr Mugabe has largely been confined to his house since the army took over on Wednesday. The governing Zanu-PF party is also meeting to discuss whether to dismiss their founder and long-term leader. The army intervened after Mr Mugabe, 93, fired his deputy Emmerson Mnangagwa. Mr Mnangagwa’s dismissal made Mr Mugabe’s wife Grace front runner to become next president. He is likely to be reinstated as vice-president when Zanu-PF convene. Tens of thousands of Zimbabweans took to the streets on Saturday to celebrate the army’s takeover and to urge Mr Mugabe to quit. Nine of 10 Zanu-PF party chapters say Mr Mugabe should step down and their decision is likely to be endorsed at Sunday’s meeting of the party’s top body, the central committee. 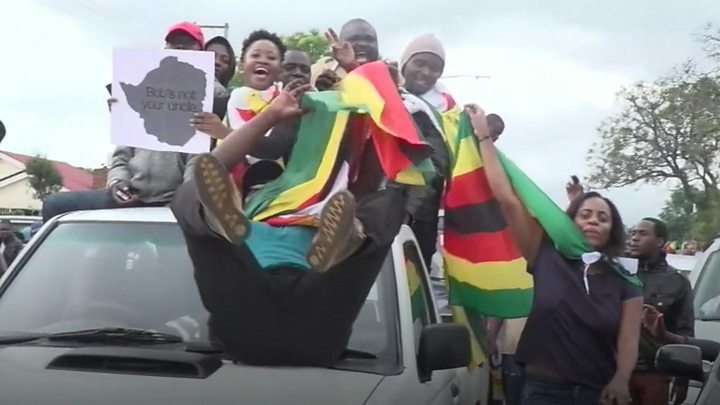 Our correspondent says the situation appears to be getting out of Zanu-PF’s control and there could be a broad push to introduce a transitional government that includes the opposition. The military maintains this is not a coup and there is international pressure to use constitutional means to resolve the political crisis. Negotiators are poring through Zimbabwe’s laws to find a legal way out. Saturday’s call for civilians to take to the streets looks choreographed to lend some legitimacy to the transition process being discussed. President Mugabe’s support base has continued to crumble. Independence war veterans, who fought alongside him against colonial rule, have also called on their former leader to leave. Soldiers seized the headquarters of Zimbabwe’s national broadcaster ZBC on Wednesday. Media captionWhy is Zimbabwe in such a bad way?